Thanks to Courtenay Dr. resident Cary Aiken, MARTA will be extending the hours of operation for Bus Route #36 (No. Decatur Rd./Virginia-Highland) from the current 9 p.m. to 11 p.m., effective April 18. Aiken noticed that when MARTA Route #’s 45 and 36 were combined a while back, connectivity to either Emory or Midtown was lost after 9 p.m. This caused problems in terms of getting home late at night from events he chose to attend in either of those areas. Aiken brought the issue to the attention of MARTA Service Planner II Andrew McBurney in January and McBurney advised in late February that Bus #36 service would indeed be extended to 11 p.m.
McBurney additionally advised that starting in April Bus #36 will be re-routed to end at Decatur Station due to a transit-oriented development construction project at Avondale Station, where the bus currently terminates. The re-route is expected to be in place for approximately 18 months. Sorry for the late notice but we just found out about a meeting you might want to attend. The Federal Transit Administration, in cooperation with the City of Atlanta, Invest Atlanta, and Atlanta BeltLine, Inc., is conducting environmental assessments for extensions of the Atlanta Streetcar. You’re invited to attend a public meeting to discuss the transit route options in designated areas along the east side of the Atlanta BeltLine corridor and in the Downtown & Midtown areas. There will also be discussion of MARTA connectivity options as well as education about the overall transit system plan and next steps. 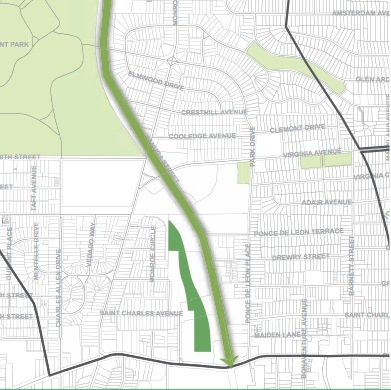 The meeting is this Thursday July 17, 6:30 – 8:30 pm at Virginia-Highland Church, 743 Virginia Ave.
Here’s a link to the Atlanta BeltLine website page where we learned about the meeting. The BeltLine Master Plan for “sub-area 6” includes the western edge of Virginia-Highland along Piedmont Park and Monroe Drive. 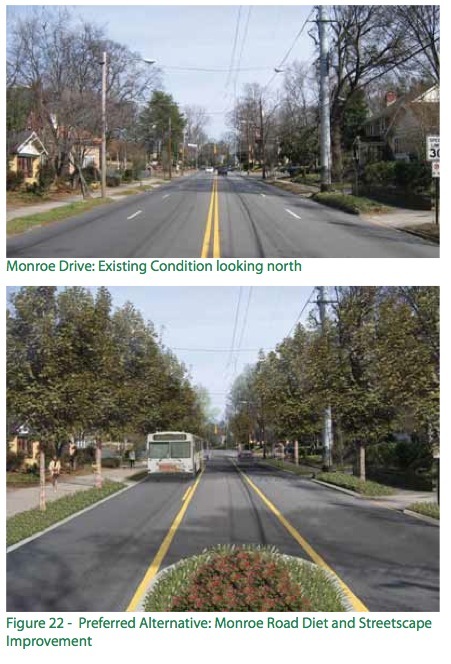 These include proposals for improvements to the intersections of Monroe and 8th; Monroe and 10th/Virginia/Kanuga; and for converting Monroe to two lanes with a median/turn lane. Diagrams cover proposed bike access and transit. The download can take a while as it’s 45 MB large: download main document here; there are also appendices (72 MB). Thanks for taking a moment to fill out this survey. It is only with neighborhood input that we can identify the public transit (trolleys, shuttles, MARTA bus service) needs of the residents and businesses along Highland Avenue. 2. What days and time frames would you likely ride public transit? Check all that apply. 3. 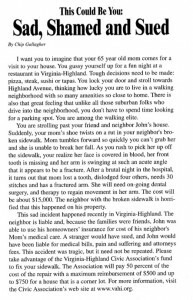 What is the distance from your home to the nearest transit stop along Highland Avenue or Johnson Road? 4. Assuming schedule reliability, what frequency would a transit schedule need to be on to meet your needs to consider public transportation to neighborhood businesses? 5. Do you currently pay for parking when you visit local businesses along Highland Avenue? I go out of my way to find a free parking spot. I’ll pay for parking but $ is my limit. 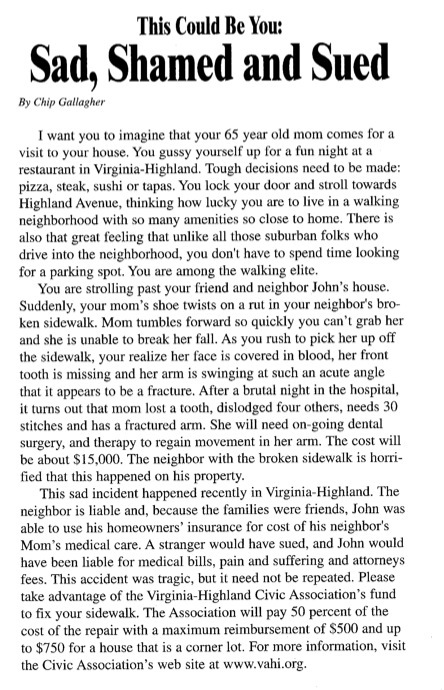 Paying for parking is part of intown living and I deal with it. I never have trouble finding a parking spot. I sometimes have trouble finding a parking spot. I always have trouble finding parking and I’ve about had it. I valet park and don’t worry about it. 7. What is the MAXIMUM fare you would be willing to pay for hassle free, reliable, convenient public transportation along the Highland Avenue? I am fine with the current stops. I would like to see shelter at the stops. Have you taken public transit to for your everyday needs (work/school/rehearsals/meetings)?